The park and garden landscape in the Ruhr is part of the region’s heritage of industrial culture. Like the impressive buildings of industrial architecture, parks and gardens reflect the history of settlement and the social and economic history of the Ruhr area. The parks and gardens around castles, monasteries and manor houses were all conceived as geometrical Baroque complexes and are examples of the early history of the region. At the beginning of the 19th century, they were changed into landscape gardens in the “English style” in accordance with the type of design which was fashionable at the time and which reflected the spirit of education and liberalism. In the middle of the 19th century, advancing industrialisation changed the appearance of the landscape between the Ruhr and Emscher rivers. Representative gardens and parks were among the new “temples of industrial power”. The middle classes with possessions and education whose economic and social strength had grown also created representative parks which became public gardens in the Ruhr area. The rising industrial towns of the first highly-industrial phase also created their own public gardens. Democratisation of urban green areas is today’s term to describe the Volksgarten (People’s Garden) movement of that time. The people’s garden was social (democratic) in that all social classes had the right to use it, it was also social (hygienic) for living conditions in that it balanced out dangerous air pollution. The Bundesgartenschauen (Federal Garden Shows) of the 1950s caused new green areas to sprout from bombed-out cities, but they did not link up with the achievements of the democratic urban green areas. They did, however, contribute to the temporary revival of the citizens’ parks until the structure of the pluralist leisure society began to make itself felt in the 1960s with the creation of the “Revierpark”. This was a new kind of park developed in the Ruhr area with the specific aim of providing a space for relaxation and sport in a highly-industrialised landscape. In 1984, a novelty was boldly attempted at the first Landesgartenschau (Regional Garden Show) in North Rhine-Westphalia, in Hamm. A slag heap in the Maximilian Park and an abandoned mining area were included in the planning of the park and “processed” artistically within the garden design as part of the industrial cultural landscape. This approach was used as a matter of course at the International Building Exhibition Emscher Park (IBA) and even became part of its programme. The new parks which have been created since the 1990s are characterised by the way they take account of and emphasise the remains of the industrial past. At the same time, an attempt has been made to include the existing natural aesthetics of areas of waste ground and disused patches of industrial land in their design. Today, the parks and gardens in the Ruhr area are more than just important open spaces for the population of the region. They are also “bearers of identity”, are of major significance for tourism as elements of the “Route of Industrial Heritage” and are not least a sign of a dynamic and forward-looking mood in regional development, which does not deny its periods of prosperity and crisis but uses these actively as unique assets. This route is being created around the anchor garden of Haus Ripshorst in the Emscher Landscape Park in Oberhausen. 5.3 million people live in the Ruhr Area. They comprise almost 30% of the population of North Rhine-Westphalia but inhabit only 13% of its surface area. Eleven urban districts and four administrative districts combine to make up the Regionalverband Ruhr (Ruhr Regional Association), a polycentric structure without any one dominant city. The east-west course of the Ruhr and Emscher rivers still determines the structure of settlement and development in the region. The region has chosen the slogan “The Ruhr Area – A Powerful Piece of Germany” to try and carve out a new position for itself and to express the lengthy and profound restructuring of its economic, urban and social conditions. Above all the tremendous pace of growth in coal mining, in the iron and steel industries and in the chemical and energy industries led to an extreme rise in the region’s population during the second half of the 19th century (only about 230,000 people lived in the region in 1840). The Ruhr Area was the driving force behind the German economy and the “dynamo of the West German economic miracle” after the 2nd World War. During this phase of growth, urban development primarily followed the needs of the economy. On the other hand, economic success and full employment as well as the resulting high level of tax revenue benefited the municipalities and their inhabitants. Change in economic and technological structures hit the region associated with the economic miracle particularly hard. Many products were no longer in demand or were imported at lower cost. Businesses were forced to close. Jobs were lost. But today there are still extremely successful companies in the Ruhr Area. These global players have opened up new markets but have also transferred jobs to “more cost-effective” locations. The environment was one of the first areas to profit from structural change: air and water pollution were noticeably reduced, land usage reversed, wastelands and slag heaps greened, and streams and their banks renaturalised. A new kind of restructuring based on a more balanced use of space and on social, ecological and cultural goals began with the Internationale Bauausstellung Emscher Park (IBA) in 1989. Although the Ruhr Area is a long way from solving all its economic, ecological, urban and social problems, an increasing number of locations have shown that creative concepts can be used to transform the industrial past into a new resource and asset with potential for more sustainable development. Unusual business locations, cultural institutions and residential areas have been created. Historical buildings have been retained and filled with new life. New, top-quality architecture consciously creates contrasts. Projects such as the →“Route der Industriekultur” and “Route der Industrienatur” invite both visitors and the region’s population to explore this surprising variety. This is best done on foot or by bike on newly-created paths, e.g. those on old railway lines and those which pass through areas which were formerly “out of bounds” and which have now been networked with striking bridges. A system of signage and a cycle route planner on the Internet are designed to help those using this network of paths. Thus it is possible to go on a “Tour de Ruhr” and experience attractions such as landmarks and lookout points, football stadiums, theatres and museums, historical villages and landscapes and the many historical and contemporary parks and gardens. The garden and park landscape of the Ruhr area is part of the region’s heritage of industrial culture. Like the impressive buildings of industrial architecture, historical gardens and parks reflect the history of settlement and the social and economic history of the area. 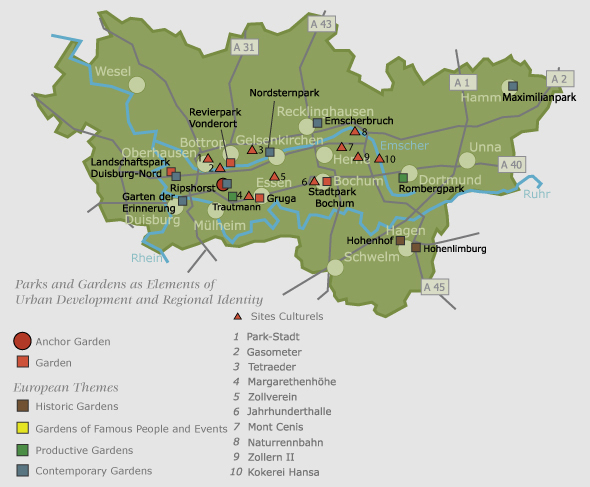 The gardens and parks around castles, monasteries and manor houses from the pre-industrial phase of the Ruhr area were all conceived as geometrical Baroque complexes and are examples of the region’s early garden and park history. At the beginning of the 19th century, these “French style” gardens were changed into “English style” landscape gardens in accordance with the type of design fashionable at the time, which reflected a spirit of education and liberalism. In the middle of the 19th century, advancing industrialisation changed the appearance of the landscape between the Ruhr and Emscher rivers. At that time, new “temples of industrial power” were built along with suitably impressive gardens or parks. An impressive example of this kind of development is Villa Hügel and its park. The economic and social strength of the prosperous and cultured middle classes had grown and they too created impressive parks and gardens. It was not long before such green spaces in the Ruhr area became municipal parks. The rising industrial towns of the first highly-industrial phase at the close of the 19th century also created their own municipal parks. Democratisation of urban green areas is today’s term to describe the ensuing Volksgarten (People’s Garden) movement of that time. The people’s park was social (democratic) in that all social classes had the right to use it; it was also social (hygienic) for living conditions in that it balanced out poor hygiene and dangerous air pollution. The Bundesgartenschauen (Federal Garden Shows) in the 1950s caused new green areas to sprout from bombed-out cities, but they did not link up with the achievements of the democratic urban green areas. Rather, they contributed to the temporary revival of the citizens’ parks until the structure of the pluralist leisure society began to make itself felt in the 1960s. The creation of the “Revierpark” marked the development of a new kind of park in the Ruhr area. In 1984, a novelty was boldly attempted at the first Landesgartenschau (Regional Garden Show) in North Rhine-Westphalia on the →Gelände der Zeche Maximilian (Terrain of Maximilian colliery) in Hamm. For the first time, a slag heap and an abandoned mining area were included in the planning of a park and “processed” artistically within the park design as part of the industrial cultural landscape. This approach was later (from 1989) used as a matter of course at the Internationale Bauaustellung Emscher Park (IBA) (International Building Exhibition Emscher Park) and even became part of its programme. The new parks which have been created since the 1990s are characterised by the way they take account of and emphasise the remains of the industrial past. At the same time, an attempt has been made to include the existing natural aesthetics of waste ground and disused patches of industrial land in their design as part of the Route Industrienatur (Route of Industrial Nature). The Landschaftspark Duisburg-Nord and the Nordsternpark in Gelsenkirchen are examples of this type of park. Parks and gardens are more than just important open spaces for the population of the region. They are also “bearers of identity”, are of major significance for tourism as elements of the →“Route der Industriekultur” (Route of Industrial Heritage) and are not least a sign of a dynamic and forward-looking mood in regional development, which does not deny its periods of prosperity and crisis but uses these actively as unique assets. Today, the development of the landscape in and between the towns in the heart of the Ruhr conurbation is part of a new, long-term programme of development in which industrial culture and industrial nature are, among other things, starting points for a new appropriation and authentic shaping of the region. The →Emscher Landschaftspark 2010 (Emscher Landscape Park 2010) programme is a firm part of structural policy in North Rhine-Westphalia. The park is structured as an integrated project which brings together environmental development, cultural landscape design and urban and economic development.